Made to your exact measurements, painted to your specific color preferences and designed with your style in mind each tail is an individualized, one-of-a-kind piece of wearable art that reflects your mermaid personality. We use durable finish waves or rapid monofin in the fluke (or fin) creating a great deal of momentum in the water with every flip of the tail. They are 100% safe for use in pools, lakes and oceans since they are guaranteed to not react to either chlorine or saltwater. Each tail is perfectly sized to your measurements for optimal comfort and a ideal fit and since they are neutrally buoyant in the water, these tail will not pull you down or add to your natural buoyancy providing you with the most satisfying and realistic experience. Using high grade special effects silicone gives the tails an authentic feel and texture, which creates a stunning looking in the water when combined with pearlized pigment for a beautiful shimmer. Hand sculpted 3D scales throughout the tail and fin or “fluke” are inspired by natural marine shapes and classic imagery of fantasy mermaid myths. With a 3 step painting system (color, shimmer and a beauty coat) tails are individually airbrushed with silicone paint to insure colors will not fade or chip and will appear vibrant and realistic in the water and on land. As opposed to tin cured silicone or other sculpting products, all our tails are made using platinum cured silicone which is body and food safe; meaning there is no risk it will ever leaching harmful chemicals into your pool or skin. Just lather with everyday baking soda, rinse and hang to dry. No need to disassemble, run through the wash or dry clean, leaving you more time to practice fish calls for communicating with your newfound fish friends. Since each individual tail is lovingly crafted to your exact specifications, they typically take 6 - 8 weeks to build, paint and fully finish. 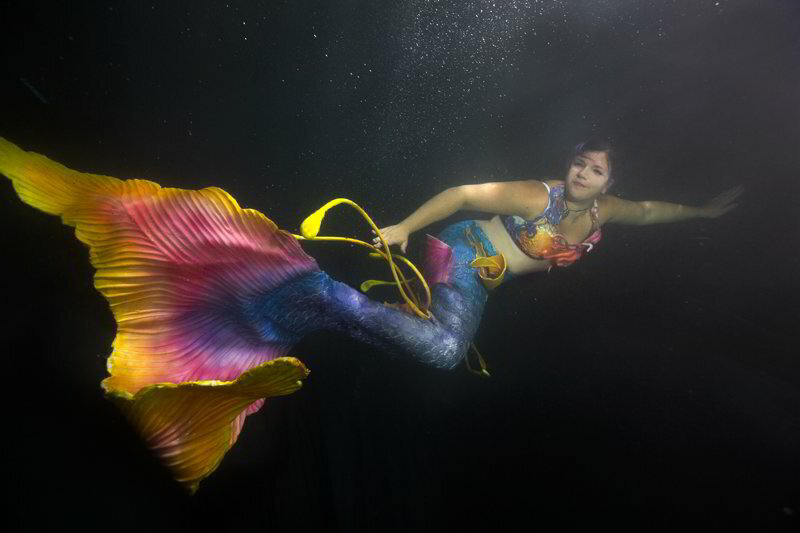 Mermaid tails are intended for experienced swimmers only. Tails are not flotations devices or toys, please swim responsibly with a mer-tender always on hand should tragedy strike. We are not currently producing youth or children's sized tails.